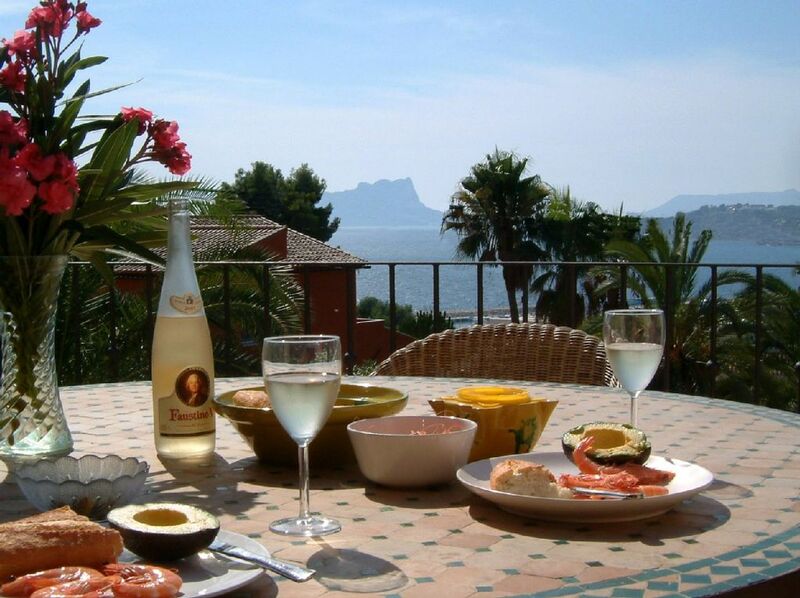 Villa La Marina is the ideal holiday villa in Moraira on the Costa Blanca. Situated in a quiet select cul-de-sac in the ideally located exclusive and tranquil area of Pla del Mar in Moraira. Just 200 metres from the sea, close to the marina, and easy walking distance of the town. It is a very short stroll to either the beautiful cove and restaurants at El Portet and village of Moraira. There are spectacular views of Moraira, the sea, and the mountains from every part of the property. Check out our photos and see the amazing seaviews and sunsets. This beautifully decorated holiday villa is hidden behind secure wooden gates and high walls with a spacious private garden and swimming pool. You will love this typical Mediterranean villa and enjoy having the choice of many different terraces offering both sun and shade. This is a great place to enjoy a quiet read, sunbathing, or cocktails at sunset.All 4 bedrooms have air conditioning, and the property has 3 separate bathrooms. Villa La Marina is available to rentas as a 4 bedroom rental in JUly and August, but can be rented on a 3 bedroom basis if required throughout the rest of the year. The villa also has a fabulous new kitchen with a SMEG oven, new dishwasher and a large fridge. Everything you might need on your holiday is provided. There is a 42" HD TV in the lounge with a good selection of UK sateliteTV channels inc. Sky Sports and BT Sport. Villa la Marina is available to rent as a 3 or 4 bedroom villa throughout the year, but during the peak summer season it is exclusively rented as a 4 bedroom villa only. Moraira and what to do..: In easy walking distance of the villa is the lovely cove that is 'El Portet', with its waters edge cafes and beautiful safe sandy beach. Alternatively it is only a short stroll to the centre of Moraira, and the main large blue flag L'Ampolla beach. Moraira still retains the charm of being a fishing village, but has added all the quality services required by the modern tourist, including a large selection of first class restaurants, shops and sports facilities: all water-sports, kayaking, jetskis, golf, tennis, horse-riding, go-karts, walking, cycling, climbing, para-sailing, are readily available. Theme parks are nearby at Benidorm and Valencia. Terra Mitica (like Disney world), Aqualandia (super slides) and Mundomar (dolphins, seals), Terra Natura, excursions, etc. - Club de Golf Ifach, Moraira, 9 holes, 7 km. - Club de Golf Jávea, Jávea, 9 holes, 8 km. - Club de Golf la Sella, Denia, 18 holes, 20 km. - Real de Faula Golf Club, Benidorm, (2 courses) 18 holes each. 35 km. - Club de Golf Oliva Nova, Oliva, 18 holes, 35 km. - Club de Golf El Saler, Valencia, 18 holes, 100 km. - Club de Golf Don Cayo, Altea, 9 holes, 20 km. - Club de Golf Bonalba, Muchamiel, 18 holes, 70 km. - Club de Golf San Juan, San Juan, 18 holes, 70 km. We live in a tiny quiet rural village in South Devon, UK, with many animals including donkeys, chickens and ducks. We had hoped to buy a second home for many years, and made several unsuccessful house-hunting trips to Spain. We are lucky enough to live in a beautiful thatched farmhouse that we love and we wanted to find a special property that we could make a true second home in the sun. We tried to avoid a new unit on a pueblo style urbanisation at all costs! Since first owning La Marina in 2006 we have had great fun and satisfaction improving the house and garden to create our ideal holiday home. Since we first bought the property we have made substantal improvements to the villa, including extra bedrooms, new bathrooms and kitchen. We also added pool heating, air conditioning and many other home comforts. We have tried to make it our real second home. As our work at home is very seasonal, we usually stay in the villa in Autumn and Spring, the wonderful climate means that we are able to really enjoy the outdoor life whenever we are there. We initially stayed with friends at their house in Moraira, we loved the area so much, that 2 months later we had bought Villa La Marina. Moraira had everything we were looking for that was lacking in other Spanish Costas. This beautiful working fishing village has a friendly village atmosphere, wonderful scenery, no high rise building and plenty of local character. Our villa, with great sea and mountain views is a very short stroll to the beaches, shops, and restaurants. We rarely use the car there. We are very happy to see our children enjoying the freedom of this charming village – a friendly and safe place. Only 2 hours from the UK. A great location to explore SE Spain – About an hour to stylish Valencia or Alicante, 30 Minutes to Benidorm with theme parks, shopping, golf courses, or up into the hills to see rural Spain too. Location, location, location. Villa La Marina boasts fabulous panoramic sea and mountain views that many guests comment on and remember. It is in an ideal position to walk into the village or to the the beaches. The villa and garden, designed with a great deal of thought and enthusiasm – we are a family of keen gardeners and artists, enjoying refurbishing this traditional villa. The heated pool, terraces - with both sun and shade, table tennis, with a new barbecue and many outdoor dining spaces mean that guests often spend most of their stay at the villa. It has been furnished in eclectic style with Moorish furniture and decorations that you see only in the Mediterranean. It is very private and safe villa in a totally walled garden with electric gates at the end of a cul-de-sac. Both double bedrooms have their own ensuite facilities. The 2 twin bedrooms share the main family bathroom. We have amazing sea and mountain views from the villa. It is a very short walk to 2 separate sandy beaches. There are great views of the Sierra Bernia mountains from the villa. Just checkout our pictures and you can see the sea for yourself. It is a very easy walk to either of the 2 local beaches. Moraira has everything you may want during your holiday, great beaches, restaurants and shops. It is only a short drive to explore the inland Costa, the mountains, valleys, almond orchards and orange groves are worth the trip. Sea views make this property very special, guests are always blown away by teh views. 42" HD LED TV with good selection of UK satellite TV channels inc. Sport. Several terraces available with sun, shade with sea and mountain views. Good selection of courses available nearby. Large selection of CDs and DVDs available at the villa. Stereo has an ipod docking stereo system. The pool is 8m x 4m with walk in steps and is very private. Pool heating available on request (This can be Can be pre-booked at additional cost of £100 per week on request). Central Heating is available for winter lets and the gas consumed is charged on a metered basis. Table tennis on terrace. Visitors to Villa La Marina can book and use two private tennis courts (for a nominal charge) on the Pla Del Mar estate (5 minutes walk from villa). These courts are exclusive to residents and guests on Pla Del Mar. Pla Del Mar is an exclusive residential development close to the town and beaches, which is both quiet and secure. This was our second visit to Villa La Marina, we stayed for three weeks again. We love the location, easy walking distance to the marina, the town centre and to El Portet beach. The heated pool is a godsend in winter. The kids play for hours whilst I can relax with a book by the pool! Lovely comfortable beds too with, I believe new mattresses were put in shortly before we arrived. Great WiFi and plenty of English tv channels which you do need in the winter months. It sound like your holidaywas a great success, and we look forward to your next visit. Anther fantastic stay at this beautiful villa! We spent a week at the villa with our son (aged 2) and both sets of grandparents. As with our previous trip, we had a wonderful time. The villa is ideally located for both Moraira and El Portet beaches and we enjoyed many evenings on the beautiful terrace sipping cava. Sally and Mike have been excellent hosts and German and Almu were very attentive once we were there. We'd highly recommend it! Thank you for your kind review Lucy, it is always great to get feedback on our guest's experience of our villa. September is a lovely time to be in Moraira. We are so pleased that you enjoyed your latest holiday at La Marina, and look forward to your next stay. We were a party of 7. Two families with teenage children. I honestly cannot fault this beautiful villa, so much so that we had already decided to return bext year before the week was over! The villa is spotlessly clean with everything you could possibly need. They have thought of everything. A very spacious villa and pool area means that everyone can have there own space. The terrace is fabulous with a view to die for! Just a 10 min walk into Moraira where we found some super restaurants and an especially nice Gin bar. We have already earmarked several new ones to try next year too. In the opposite direction is a 10 mins walk to a beautiful little beach which was very family friendly with a lovely little cafe for a coffee in the morning. Sally and Mike couldn’t be any more helpful, from recommending transfers from the airport to day trip suggestions. Looking forward to returning. Thank you for your kind review, we are so pleased that you are returning next summer with your family. We love the fact that the majority of our guests now regularly return to stay with us, enjoying the villa and Moraira as much as we do ourselves. Welcome to that club! When we got to the Villa we had a lovely welcome pack waiting for us which we were grateful for as we arrived late. The Villa was exactly what we wanted. The Kitchen was very well equipped, the lounge was a good chill out area as was the veranda with its great sea views. All of the bedrooms were light and airy with good Air Con. We loved the pool, we couldn't get the children out of it. We will always remember Villa La Marina and would like to thank Sally and Mike for being such great hosts. You have a lovely Villa in a lovely part of Spain. Thank you for your kind review of Villa La Marina. It sounds like you had the great family holiday that you were looking for when you first booked to stay with us. We have tried to ensure that the villa has everything that we, and our guests are likely to need whilst there. Every year we try to make improvemets to the villa, and are already making plans for the 2019 season. Lovely villa, beautiful sea view in a very good location. The heated pool was a huge advantage for a young family, as it allowed the little ones to stay in the water longer. Would love to return. Thank you for a wonderful week. We have some very special family memories. Perfect location, lovely facilities and a very relaxing holiday. Will be back. We are so glad that it was everything that you wanted, and we look forward to your next stay. Moraira is an unspoilt traditional fishing village located on the Costa Blanca that is only around a 1 hour drive from Alicante or Valencia airports. Moraira has been sympathetically developed, retaining all the old Spanish charm. It is known as the jewel of the Costa Blanca. There are many fine restaurants, bars, and shops. The town has a blue flag award-winning, clean and safe sandy beach, as well as another lovely sandy cove at El Portet. There are many excellent golf courses nearby. - Club de Golf Jávea, Jávea, 9 holes. - Real de Faula Golf Club, Benidorm, (2 courses) 18 holes each. Please note that Villa La Marina is only let as 4-bedroom property between July and the beginning of September, and the Main Season rates are for 4 Bedrooms. The prices shown for the rest of the year are for 3-bedroom rental. (The 4th bedroom is available during those months at additional cost of £250 per week). In the event of cancellation of the booking by you, the full amount of the rental fee will be charged, unless we are able to re-let the villa for the period booked by you. The deposit is non-refundable; we therefore advise that you arrange for the appropriate insurance against cancellation. Changeover day is Saturday. Full weekly linen exchange and end-of-stay villa clean included.